What function do dental bridges have? What dental bridge types are there? Dental bridge or dental implant? A dental bridge can fill in the gap left by a missing tooth or several missing teeth. The main parts of a dental bridge are the bridge unit (which replaces the missing tooth or teeth) and the pillar (which supports the bridge). Pillars may be natural teeth, tooth roots or implant. The bridge is attached to the pillars with the help of an anchor. If for example, the last tooth of a jaw is missing, the two penultimate teeth before the missing tooth are crowned and joined together. Therefore the last bridge unit has an anchoring point only one side. Consequently this type of dental bridge is not as stable as conventional dental bridges and dentists only recommend it if the crowned pillar teeth can withstand the load well. With inlay bridges, the bridge is not fixed on crowns, but on two inlays of the adjacent teeth. As a result, an advantage of this solution is that the neighboring teeth do not have to be ground down. 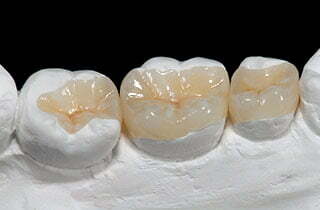 A disadvantage is that the mastication pressure can loosen the cementation of the inlays after some time, so it is not suitable for every bridge replacement. Therefore it remains a rarely applied solution. This bridge type is suitable for the front teeth. This type has the advantage that the pillar teeth must be only minimally prepared on the inside. Unlike other bridge types, the anchors are thin metal plates, not dental crowns. Although this method protects the tooth, it is not as stable as firmly anchored bridges. The telescopic bridges are a removable replacement solution, since these bridges are not firmly cemented on the pillar teeth, only placed on them. Metal-ceramic (nickel free) – Ceramic alloyed to metal. The cheapest. Zirconia (produced with CAD technology) – all-ceramic. Most aesthetic, resemble the natural teeth the most. 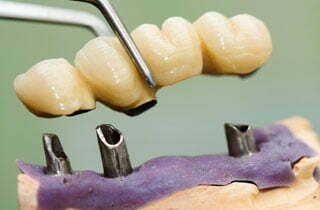 Just like dental implants, dental bridges are used as a replacement. Therefore when selecting the appropriate solution, you have to consider several factors such as aesthetic and functional features, and take medical factors into consideration. Of course, both systems have advantages and disadvantages, which must be considered individually in each case. An implant-supported dental bridge is a bridge anchored on implants and not on natural teeth. In the UK is a similar treatment too expensive for you? We understand that it can be difficult to travel to a distant country and have complex dental services, so many questions may arise. ATTENTION: Your request is important to us so if you, after you have submitted your request, were not redirected to another page within few seconds and have not received a confirmation e-mail (please also check your spam folder); please reload the page, fill out the form and press the 'SUBMIT' button again. If the retry has failed, please contact us on info@cheapdentalimplants.co.uk, e-mail address or call us on +44 20 3769 3987.